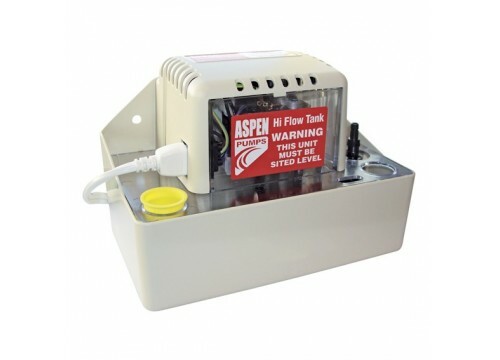 Aspen’s Hi-flow tank pumps are designed to collect condensate water from refrigeration and air-conditioning units. They operate automatically when the float rises and will discharge to a head of 4.6 metres. The Hi-flow will pump a greater volume of water than the Hi-lift, but to a lesser head. The Hi-flows incorporate two high quality switches, activated by a float system.One operates the centrifugal type pump and the other is used as a high level safety switch. In the event of a pump failure this device will switch off the refrigeration unit and can simultaneously activate an optional audio and/or visual alarm. The deck of the pump is clear plastic for quick and easy internal inspection, and it comes with a 2 metre long cable with push-in plug which makes installation and maintenance easier. In all cases a tank pump must be sited under the source of the condensate. Pump rating: 0.6A, 230V A.C.